Adam Buxton returns to the BFI Southbank in London in early December for the final BUG shows of the year, presenting a brand new latest selection of the most creative new music videos with his typcial buffoonery, in BUG 49. The all-new show premieres on Friday, December 4th at 8.45pm with the best new music videos seen on the big screen - plus lots more goodies via Adam's laptop – and a very special guest. 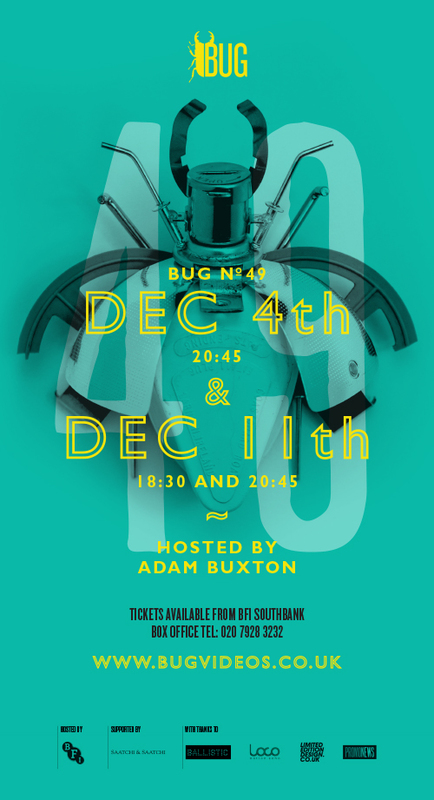 That's followed by two more shows of BUG 49 the following Friday on December 10th at 6.30pm and 8.45pm. Tickets are now on sale for all three shows - book them online before these shows sell out, or call the BFI Southbank box office on 020 7928 3232. BUG returns in early July with a very special new show, for a very worthy cause. Adam Buxton and BUG are bringing the bestselling David Bowie Special show to Los Angeles on Thursday November 16th. After three sell-out shows in London in February and March, Adam Buxton is taking the BUG David Bowie Special around the UK in the next few months, beginning in Manchester this Sunday, April 17th.